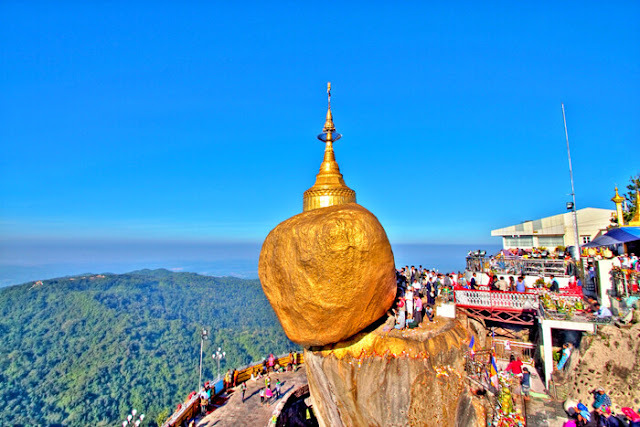 The huge Golden Rock is what makes the Mount Kyaiktiyo (Kyite Htee Yoe) famous. Perched at the summit of the mountain, the Golden Rock in Myanmar is one of three most sacred religious sites in the country, along with the Shwedagon Pagoda and the Mahamuni Temple. Pilgrims usually come here from far to worship and add gold leaf to the rock, which seems to defy gravity by delicately balancing on the edge of the 1100-metre high mountain. The legend of Golden Rock is associated with a story about Buddha on one of his many visits. In his visit, he gave a strand of his hair to Taik Tha, a hermit who then tucked it in the tuft safely. After that, it was in turn gave the strand to the King, with the wish that the hair will be enshrined in a boulder shaped like the hermit’s head. The King was believed to inherit supernatural powers from his father Zawgyi, a proficient alchemist, and his mother, a naga serpent dragon princess. After finding the rock at the bottom of sea and with the help of the Thagyamin, the king of Tawadeintha Heaven in Buddhist cosmology, he found the perfect place at Kyaiktiyo to locate the Golden Rock and built the Golden Rock Pagoda (or Kyaiktiyo Pagoda), where the strand was enshrined. According to the legend, it is the strand of hair that prevents the rock from tumbling down the hill. The boat used to transport to rock turned into a stone, which created another place worshiped by pilgrims at a location about 300 metres (980 ft) from the Golden Rock. It is known as the Kyaukthanban Pagoda (literal meaning: stone boat stupa). It is also believed that pilgrims undertaking the pilgrimage by trekking from the Kinpun base camp three times consecutively in a year will be blessed with wealth and recognition. Mentioned uncountable times in Myanmar reviews, the Golden Rock is glorified as one of most amazing places to see in Burma thanks to its unique structure. 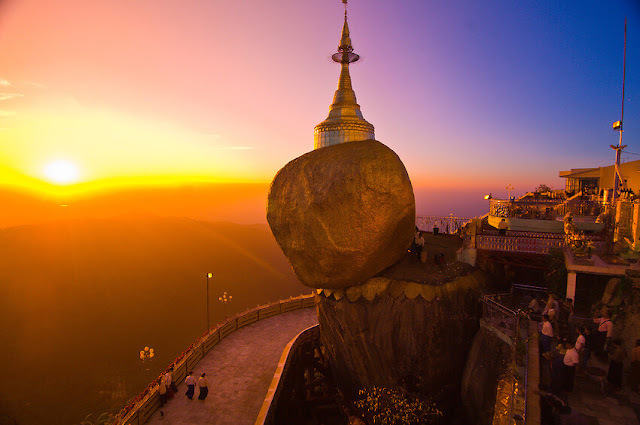 The boulder gleaming golden and popularly known as the Golden Rock on which the small Kyaiktiyo Pagoda is about 25 feet (7.6m) high and has a circumference of 50 feet (15 m). The Pagoda above the rock is about 24 feet (7.3m) high. The boulder sits on a natural rock platform turning up to have been naturally formed to act as the base to build the pagoda and lies on an inclined place and the area of contact is extremely small. The Golden Rock or boulder and the rock table where it is resting are independent of each other. The Golden Rock has an overhang of half its length and perched at the extreme end of the sloping surface of the rock. A vertical drops in the rock faces, into the valley below. A lotus shape is covered with layers of gold leaf encircling the base of the rock which seems to crash down at any moment. There is a staircase leading to the pagoda complex that houses several viewing platforms, pagodas, Buddha shrines, and nats. However, the mysterious Golden Rock is the main attraction where the pilgrims pray and stick golden leaves on the rock in reverence. Walking a short distance, you can see a circle of gongs with 4 statues of nats and angels in the centre. A main square close to the Golden Rock has numerous establishments dealing in religious paraphernalia for worship and offerings made by the pilgrims. Next to the plaza area is the Potemkin village with many restaurants, gift shops and guest houses. Recently, a new terrace has been built at a lower level to serve visitors to take a good view of the Rock and pagoda. The Golden Rock is not only a tourist attraction but also a popular pilgrimage. During the peak season of pilgrimage, from November to March, the Golden Rock is filled up by atmosphere of devotion. When the Golden Rock is immersed in the different shades from dawn to dusk is also when pilgrims’ chants reverberate in the precincts of the shrine. Men cross over a bridge across an abyss to affix golden leaves (square shaped) on the Golden Rock’s face to express the deep veneration. However, women cannot cross the bridge because they are not allowed to touch the rock. Pagoda is visited by both pilgrims from all regions in Myanmar and a few tourists from all over the world. Even disabled persons who are loyal devotees of Buddha also visit the pagoda by walking up the track on crutches. For old people who cannot climb, they are carried on stretchers by porters to the Pagoda to offer prayers to Buddha. Specially, the Full-Moon Day of Tabaung in March is a special occasion for them to visit the shrine. On this day, pagoda’s platform is usually lighted with 90,000 candles as reverential offering to the Lord Buddha. Other offering of the devotees to the Buddha are fruits, food with incensing, too. From Mawlamyine and Hpa An: Daily buses stopping at the nearby town of Kyaik Hto are available. or you can go via Bago. *It’s more than 200km far from Yangon. If you want to go on the Kyaiktiyo temple, you sure have to pass Golden Rock. However, only men can approach Golden Rock, women could only remote viewing.